Punch with another defamation case, Delhi Chief Minister Arvind Kejriwal has reportedly removed former Bharatiya Janata Party leader and noted lawyer Ram Jethmalani as his lawyer, according to news agency ANI. New Delhi: Punch with another defamation case, Delhi Chief Minister Arvind Kejriwal has reportedly removed former Bharatiya Janata Party leader and noted lawyer Ram Jethmalani as his lawyer, according to news agency ANI. However, Delhi Deputy Chief Minister Manish Sisodia denied the reports that the Delhi CM hasn’t removed Jethmalani. Ram Jethmalani was Kejriwal’s lawyer in the defamation case filed by Finance Minister Arun Jaitley. The move by Kejriwal comes days after Jaitley filed another defamation suit against Kejriwal after he allegedly used a derogatory word against him during the hearing of the previous defamation case. Jethmalani, during the hearing of the previous defamation case, had called Jaitley a ‘crook’ in court. On this, Jaitley had asked whether it was Jethmalamni’s remark or his client Kejriwal’s. 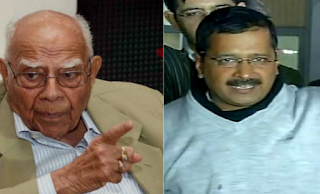 Jethmalani had stated that it was Kejriwal’s remark, following which Jaitley filed the Rs 10 crore defamation suit. The Delhi High Court has issued a notice to Arvind Kejriwal in the fresh Rs 10 crore defamation suit filed by Jaitley. Joint Registrar Pankaj Gupta issued the notice to Kejriwal and has posted the matter for July 26. Earlier last month, Arvind Kejriwal was also caught in a row after he wrote to the Delhi LG seeking funds to pay Ram Jethmalani’s fee. Questions were raised as to how Kejriwal could use the Delhi government funds for his personal defamation case. The BJP had termed the Delhi government’s move to clear bills related to the defamation case as a “dacoity and loot” of the people’s money and said that it will not let this happen. Jethmalani had then said that id Kejriwal couldn’t afford him, he would treat the Delhi Chief Minister as he treats his ‘poor’ clients and will fight the case for him free of cost. No Jethmalani as a lawyer of Arvind Kejriwal, says report; AAP denies it Punch with another defamation case, Delhi Chief Minister Arvind Kejriwal has reportedly removed former Bharatiya Janata Party leader and noted lawyer Ram Jethmalani as his lawyer.